Frequency 55 contact lenses by Cooper Vision are designed for daily wear and should be replaced monthly. 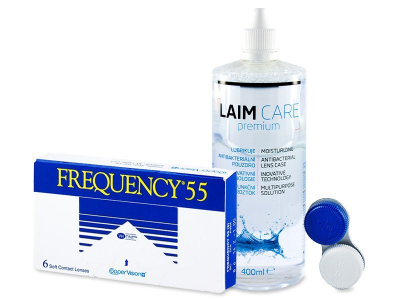 This value package also contains a 400 ml bottle of Laim-Care solution. Frequency 55 contact lenses by CooperVision are intended for daily wear and have a monthly replacement schedule. At the end of the day, they must be removed, cleaned, and stored in a case with cleaning solution overnight. Frequency 55 contact lenses are slightly tinted for better visibility and handling. They contain 45% Methafilcon polymer and 55% water.